I've been kind of hinting for a while now that something is going on in my personal life (the lack of Wardrobe Wednesdays, for example...) and it's time to share the BIG NEWS! Todd and I are expecting our first baby! I'm due on January 23rd, 2012. Right now I'm past the first trimester, and during that time things were a little shaky. I had morning sickness, I had late afternoon sickness, I had evening sickness... even being on the computer made me nauseated. So I had to take a break, but the good news is that although things aren't 100%, it is a lot better than it was! We do not know if the baby will be a boy or a girl yet, but we do plan on finding out! We also have names picked out already, but those are a secret! I promise they'll be fun. You can see some of the many gifts we've already received from friends and family for our new addition in the photo above. 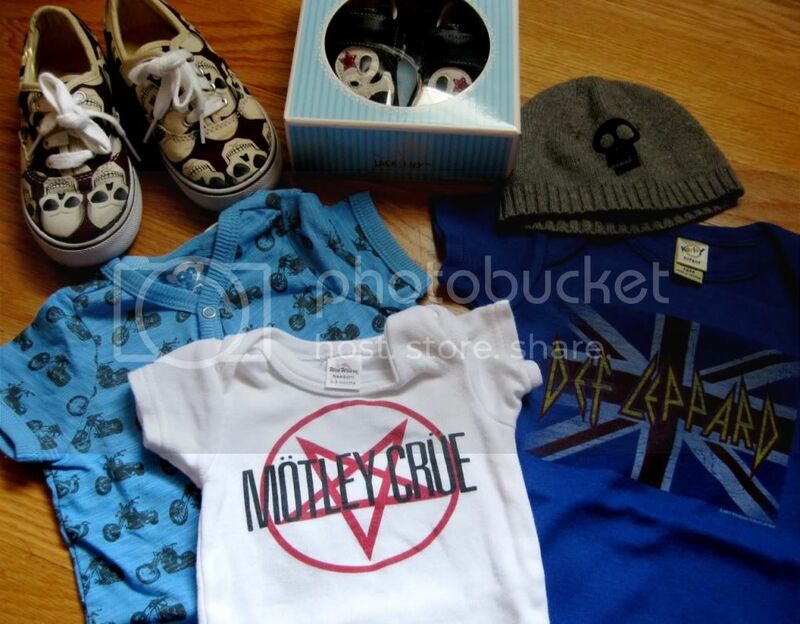 Boy or girl, this baby's gonna be well-dressed! So, to celebrate the big announcement, I'm offering 15% off at the Hell Razor Etsy shop when you enter the code OHBABYBABY with your order! Because babies cost big bucks, and we sure could use the money! This is a wide shot of the garden from the lowest point, looking up to the highest level. The rocks are huge, and create a whole bunch of interesting nooks and crannies where plants and flowers can grow. I really like what my aunt does with greenery and ground cover, because I'm not an expert gardener when it comes to flowers. I could probably grow some green stuff though! 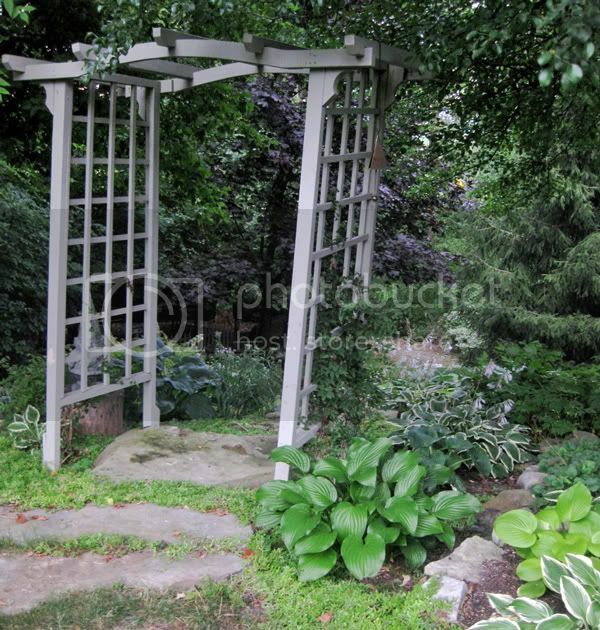 This wooden arbor is at the top of the yard, and is the entrance to a stepping-stone stair path down to the lower level. 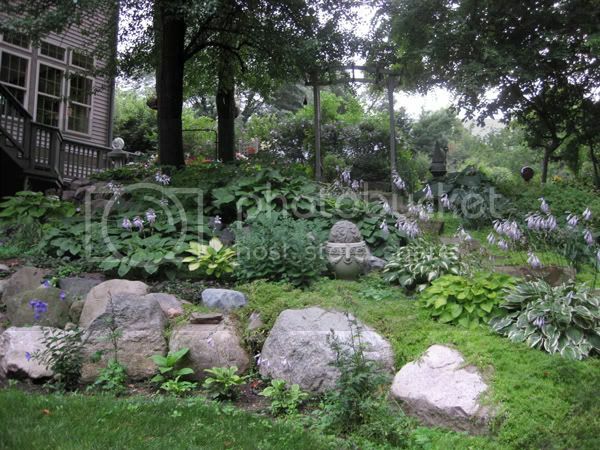 As you walk down, you notice lots of interesting greenery, little stone statues, and garden decorations. There's a lot to see! Here's my POV as I walk down the stone path! 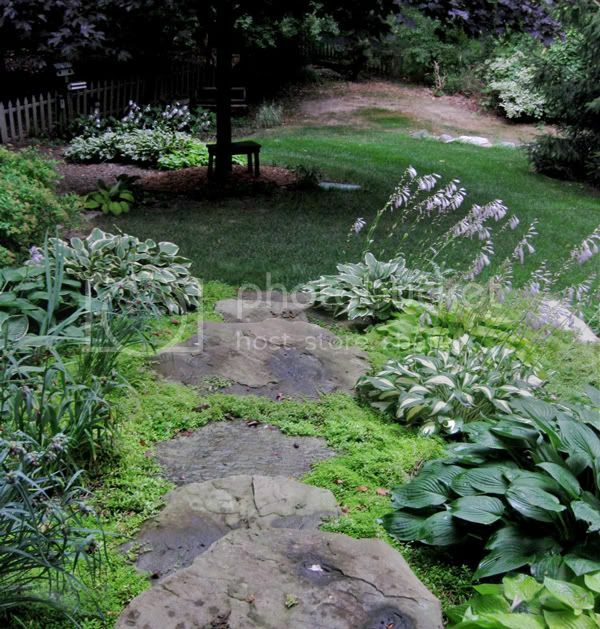 The lime green leafy ground cover around the rocks was one of my favorite plants. 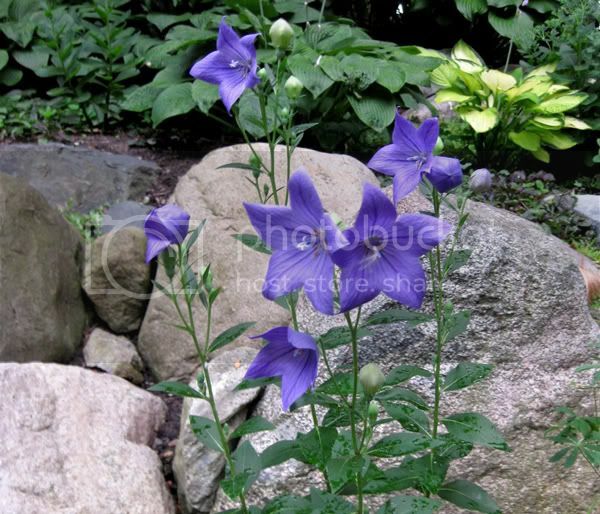 This is called a balloon flower. I love the beautiful blue-violet color! 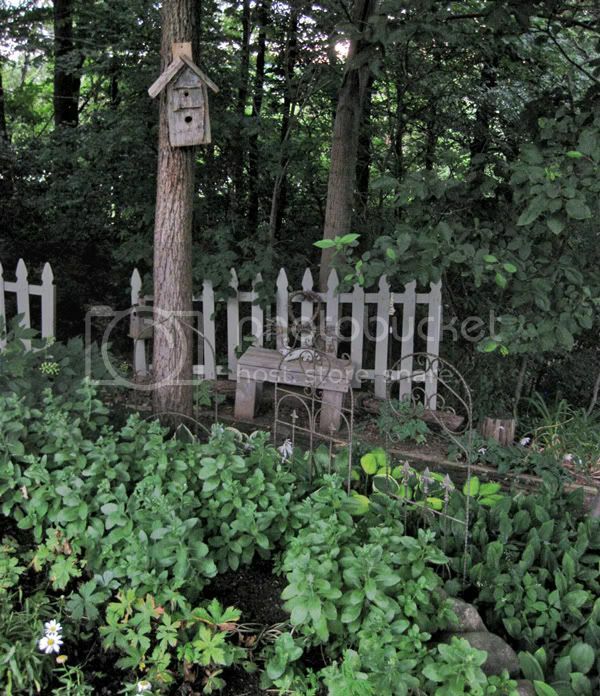 Here's one example of the many little vignettes in the garden. This area has a tiny brick walkway made of bricks that were dug up while gardening next to the path! 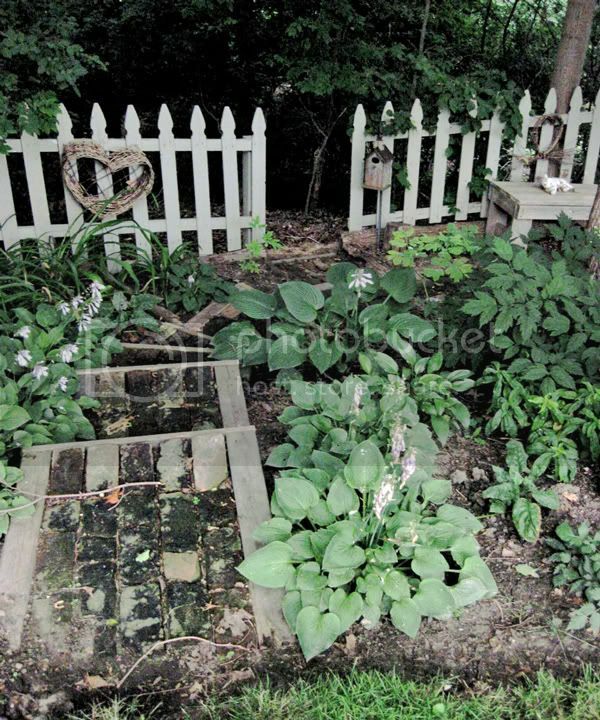 I also love how two wooden picket fence panels can separate and mark areas for little outdoor "rooms" in the backyard. This is the same section of garden from a slightly different angle. There are three small wrought-iorn decorative trellis-like pieces stuck in the ground among the plants. I really love this trio, and would love to find some just like them for my own garden. The shape makes me think of old gothic headstones. Probably not the general idea that my aunt would be shooting for, but an aesthetic I absolutely adore. Also, I was lucky enough to be gifted a wooden birdhouse from my aunt! 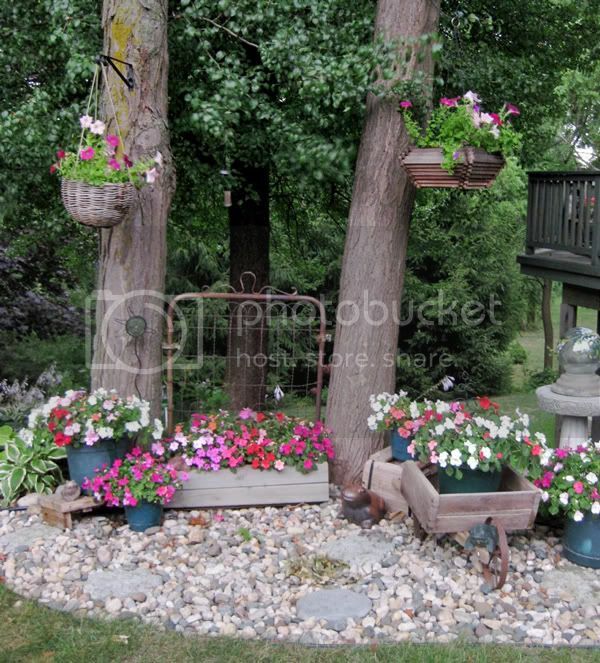 She makes them (along with other garden-inspired decorations for indoors and out), and I am excited to hang mine from our tree in the backyard soon, much like she has in the photo above. 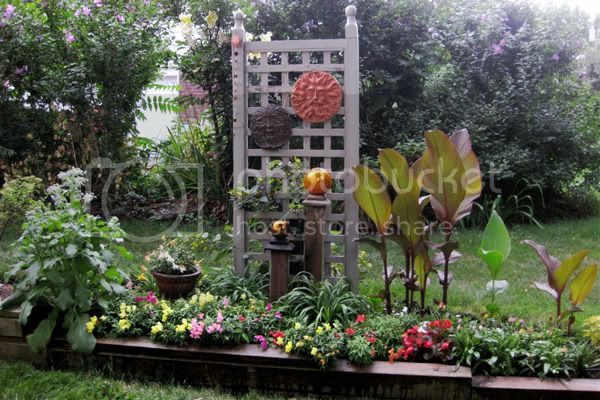 Who would've thought to put an old metal gate in their garden as a decoration? The placement between two trees makes good use of an otherwise awkward space and could also double as a trellis for climbing plants! My favorite piece in the whole garden! A gnome! I love the garden stake next to him, it makes me think it's his magic wand or staff. 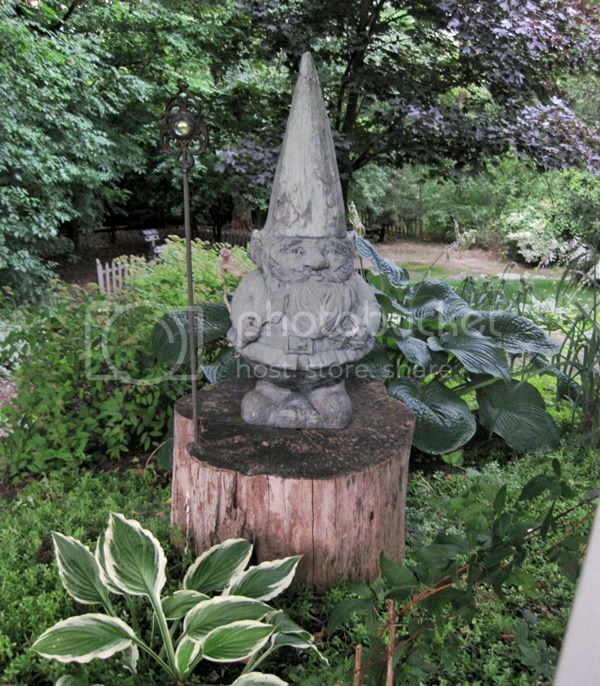 My aunt utilizes naturally-existing tree stumps as tiny tables to feature garden statues or other fun decorations. 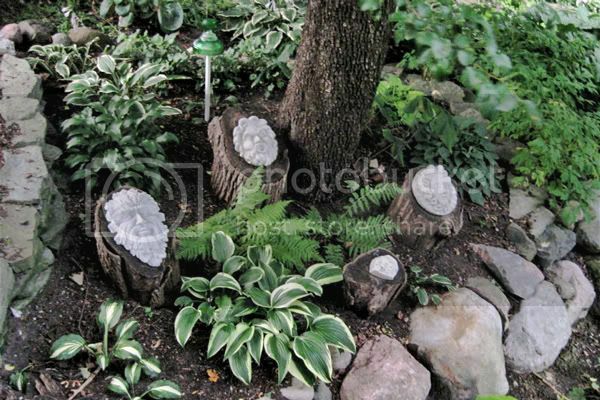 Here's another clever tree-stump display. These stone faces are visible when you peek out over the back porch balcony. Visiting my aunt's backyard garden was so inspiring for all of the plans I'd like to one day incorporate into my own garden landscape. I know I have a long way to go, but it's good to daydream! I first read about Free Crappy Portraits from Donna over on her blog, and I instantly fell in love! I thought I'd give it a shot and try writing to them - see if they'd be willing to draw me a free crappy portrait, too! 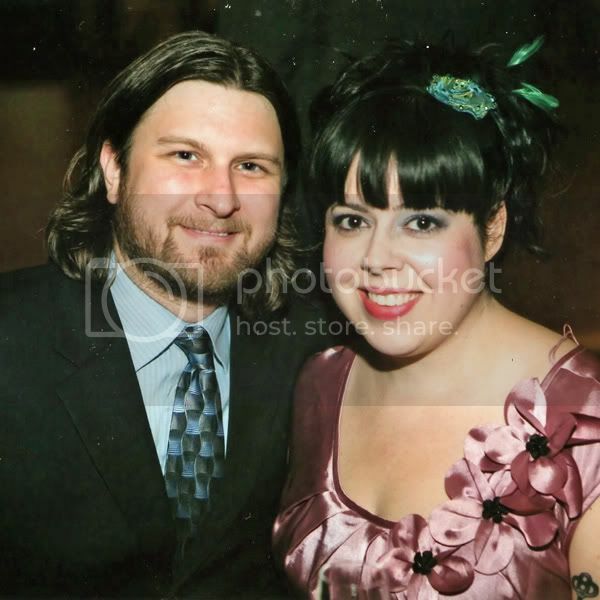 "My husband and I are both art teachers. 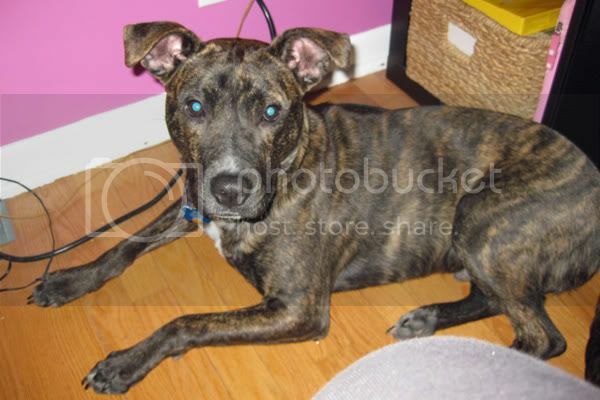 We have an awkward rescue dog named Motorhead, who is part Boxer and part Boston Terrier. 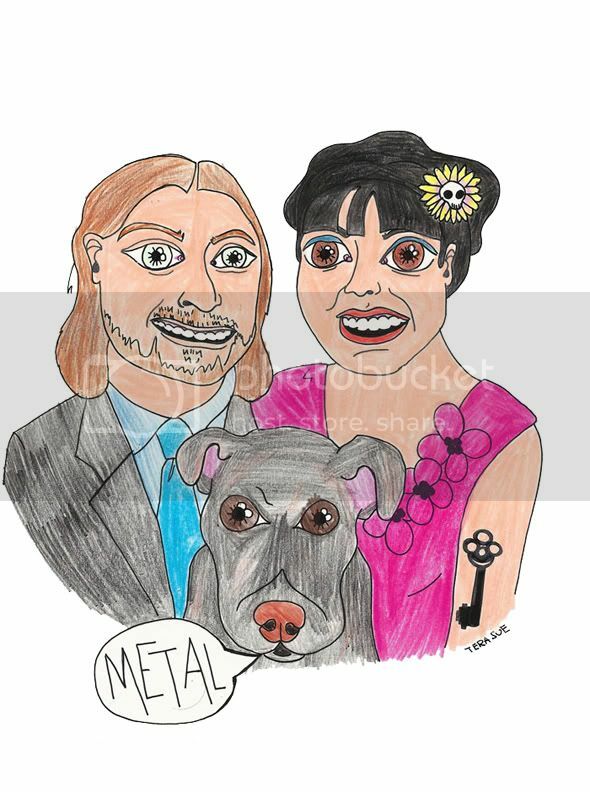 We are all huge heavy metal music fans. We collect toys, CDs, records, books, and tattoos." Isn't this hilarious? I was so excited when I opened up my email and saw it! Todd wants to make it our Facebook profile pic. Hee hee. Thanks for telling us about this site Donna! p.s. Thanks for hanging in there while I was out of town (and absent from the blog) visiting my aunt in Michigan this past week. She has a beautiful backyard garden, and I'll be sharing lots of photos with you later this week! The triumphant 1-week return of Manicure Monday! Today I am bringing back Manicure Monday, but I have to warn you that I know it won't be back for at least a couple of weeks after this. On Friday, I'm going on a trip to Michigan with my mom to visit family. We won't be back until late Tuesday night, so I know I won't be here for next week's installment. Up front apology. My mom borrowed a couple of polishes from me several weeks ago, and I got them back last week. I had them sitting on my bathroom sink, and decided that they looked good together, and that it might be fun to use both polishes at one time to do my nails, creating a pink-ish theme. I coated them with a clear top coat because I'm hoping it holds up through the trip! Here's the deets: the hot pink polish is "Pompeii Purple" by OPI. 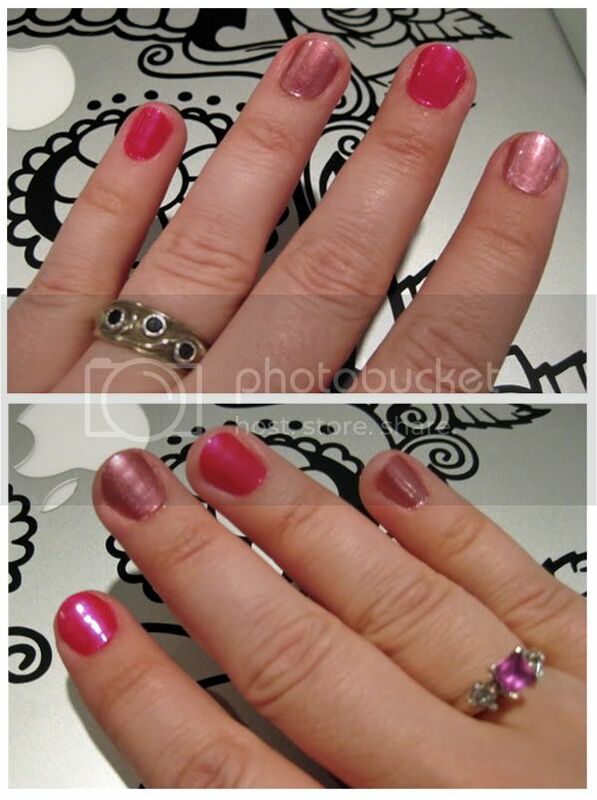 The metallic-y purply pink (kind of a neutral shade, don't you think?) 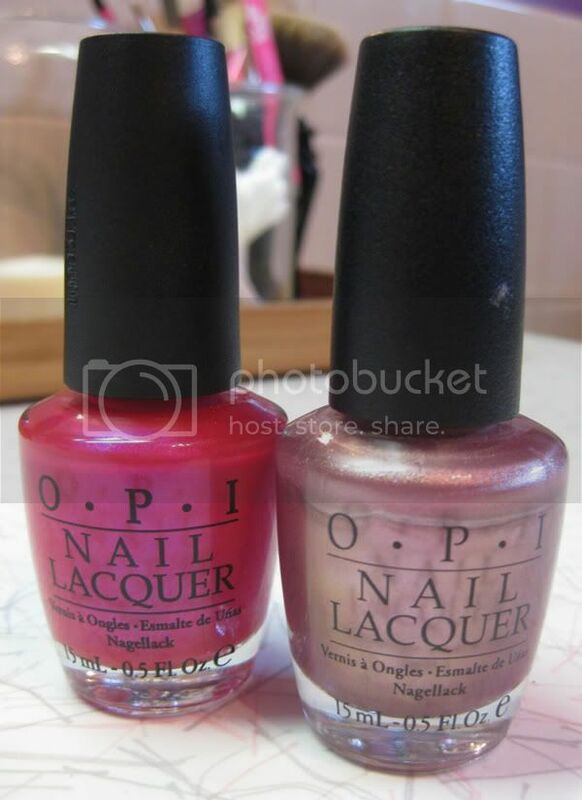 is called "Blushingham Palace" by OPI. Take some time this Monday (its way too hot out to do anything else!) and give yourself a pretty manicure! Me: Hey mom, do you think I'll be able to find some scrapbooking paper with zombies on it when we get there? Me: Yeah, you're probably right. When you get to the store, you're handed a sheet of paper that lists the projects you're going to make in the class, and how many pieces/what type of paper you'll need. It's included in the price of the class, and you pretty much get to pick from whatever's at the store. Sounds cool, but you do have to hunt a little to stay away from cutesy and find the right stuff. 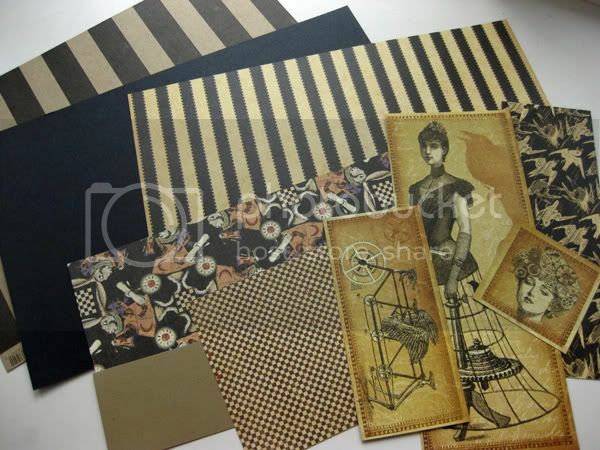 I opted for a couple of different kinds of vertical stripes, all black paper for my solid color choices, a sheet of "steampunk" designs (has the bird print on back), and an Alice in Wonderland design with rabbits that looked kind of vintage-y. 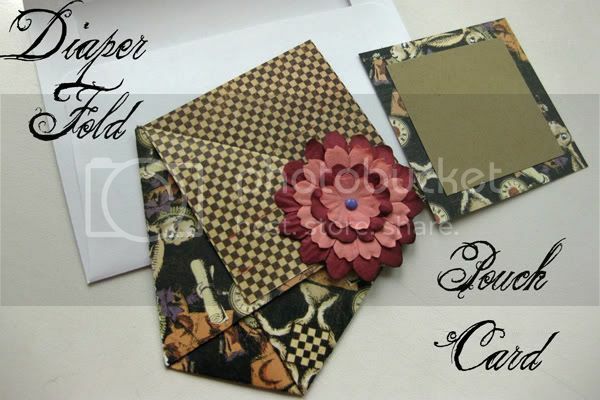 The first card we made was called a diaper fold, and it makes a little pouch to put a card or note or candy in. I made a tiny notecard to fit inside. The checkered print is the reverse side of the rabbit paper. At the end of class when we had time to decorate our cards, I dug through an "extras" bin to make the layered flower accent. It was kind of like layering flower petals when I make Hell Razor hair clips! I didn't have time to properly finish this second "Magic Hidden Message Card." I used one of my striped sheets of paper, which has the damask print on the reverse side. 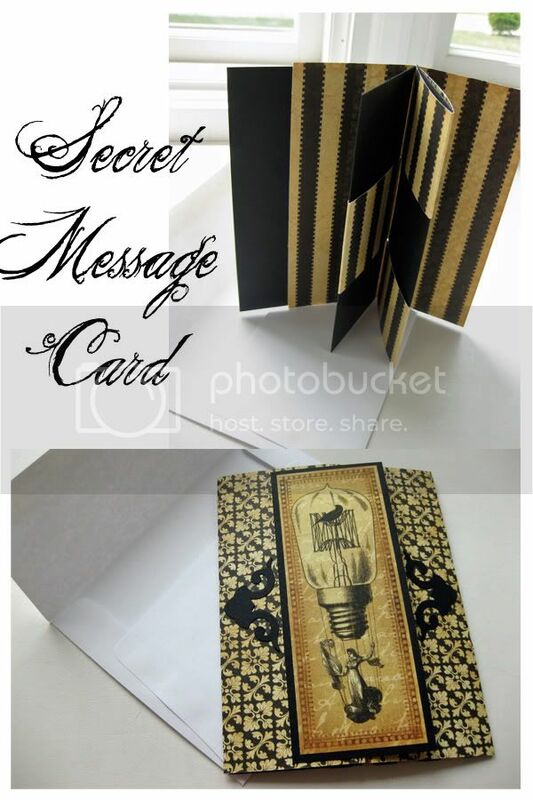 To make the secret message flap (seen in the top photo where the card is standing), we had to weave two paper strips into the folded paper card. I used one of the steampunk designs from the other paper to make a front decoration, but I haven/t done anything with the inside yet. I was thinking of using a rubber stamp with a white ink pad on the black paper strip sections. This card was pretty fun to make because it required a lot of scoring and folding. Plus, I really like this black stripe on brown craft paper. 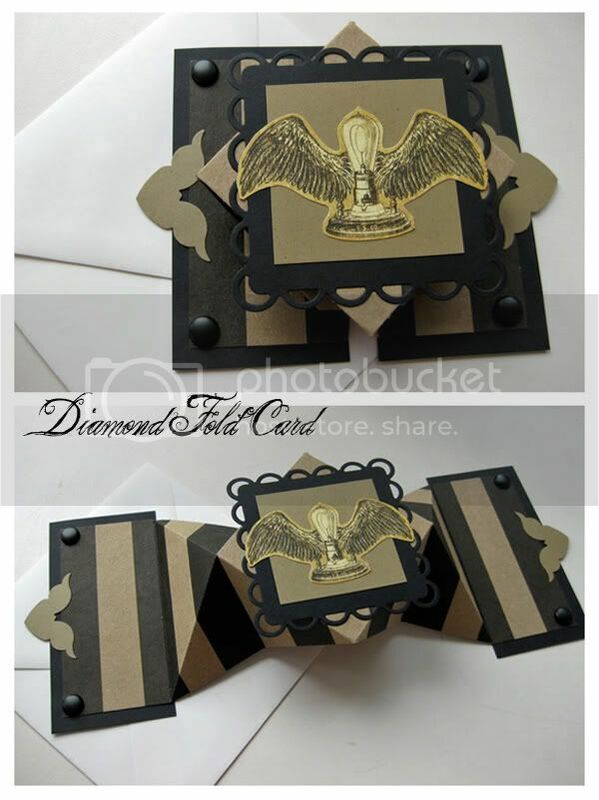 I once again used some of the steampunk designs to decorate the center of this card, and I found some black metal brads in the freebie bin to decorate the corners (I used these on the final card below, too). 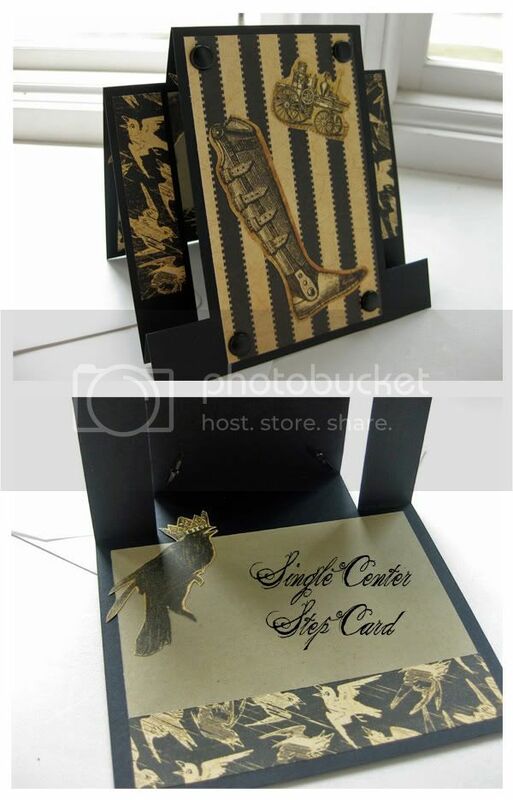 This final card is called a single center step card. It required an assortment of slits to be cut, some scoring, and folding. I was most excited to decorate this card because I saved the random leg image from the steampunk paper especially for it. I told my mother-in-law that it was the closest thing in the store to something zombie-ish, and that I now just need the perfect occasion to send someone a leg card. On the inside, I used a cutout bird and some fancy bird patterned paper along the bottom. Have you done anything a little out of your stereotypical "zone" this summer? How did you make it work? I have to share this story with you, because it's kind of amusing, completely overwhelming, and definitely a learning experience! A while back, I had posted an entry on the blog about free stickers. I figured the 50 or so blog readers and handful of Facebook fans (at the time) were enough for me to handle, and not every person would actually request stickers from me. I was right. I only received a few requests, so I had a fun time hand-writing notes and personalizing requests, often including a button or other fun goody with the mail. Then, my blog post was placed on a "Free Stuff" website (by a well-meaning blog reader, who was really only trying to help, so I thank you for that! ), but it then was then re-posted (and RE-POSTED again!) on other "Free Stuff" websites. Eeek. At first, the extra traffic was flattering and exciting. In the first 1/2 hour, I had five requests. No biggie. But the next several hours resulted in over 100 new requests, and the number was growing bigger. My Facebook fans jumped significantly. This was four days ago. I now have over 400 requests for free stickers. I've already received emails from people, asking where their stickers are. Huh? If these requests were all genuine, I might feel differently. Some of the emails have been really sweet, saying things like "Hi! I'd love a few stickers and will gladly send pics of where I've stuck them." or "I am already a fan of yours on Facebook, and would love to help spread the word.."
...most emails say nothing at all. Just an address. GIMMEGIMMEGIMME. Or they don't even know how to read! "Please email me a free razor. I would love to try it." I've also received several that demand a specific amount: "Can I get 2 stickers please" or other fictional items: "Please send stickers,would love a key chain." Now, ask me how many new sales I've had at the Etsy shop. ZERO. ...and I'm pretty sure I'll need to have more stickers printed, too. This is going to take me WEEKS, and people just need to understand that. Let this be a lesson for me, and anyone else who might be thinking about doing a freebie like I did! p.s. I will ALWAYS include free stickers and a button with all Hell Razor Etsy shop orders. I will also give you first priority in shipping, over and above all the sticker requests I have. p.p.s. Help defray my shipping costs by buying from the Etsy store! If you enter the code FACEBOOK at checkout, get 15% off of your order! 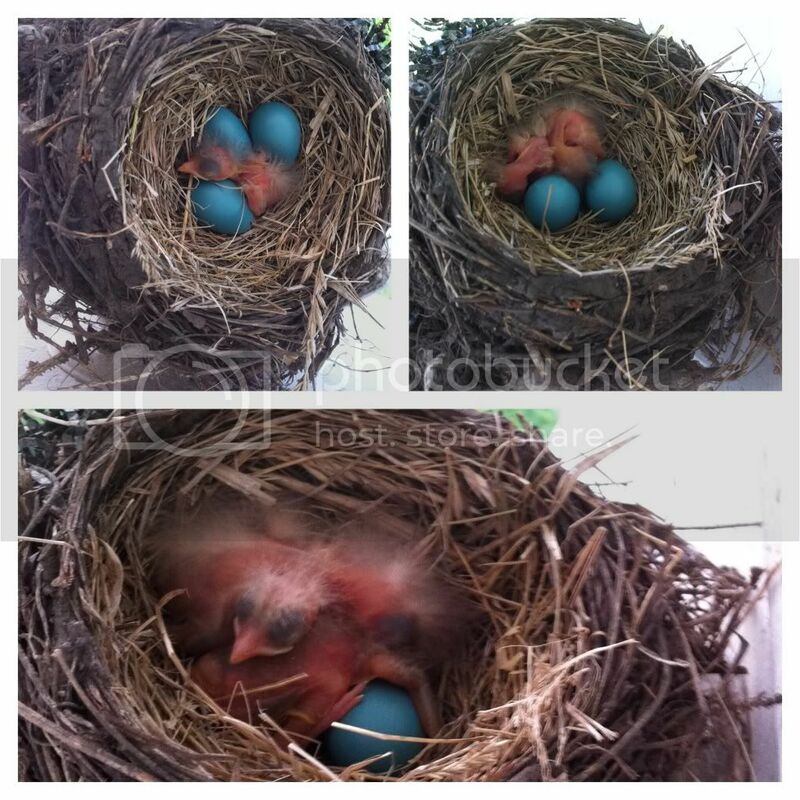 In an earlier post, I told you about the robin family that decided to make a nest in our backyard, and I even had a photo of the nest with four bright blue eggs. Here's an update on the babies! Todd has been taking a photo of the nest each day with his iPhone. Surprisingly, the momma bird has NOT gotten angry and tried to dive-bomb him, which is what I thought would happen! Instead, she flies to the fence, watches carefully, and sometimes chirps at us. But we never touch them, we just like to see what's going on. In the above photo collage, you can see the progression of three eggs hatching over the course of three days. Sadly, the fourth egg never hatched. But we eagerly watched the three babies in the nest each day until July 3rd. On that day, we arrived home from a party at my mom's and discovered one of the babies on the ground. It was too late. I cried and cried. I don't know how it happened, or why, but I kept thinking of how sad it would be for that robin to only have half of your babies survive! 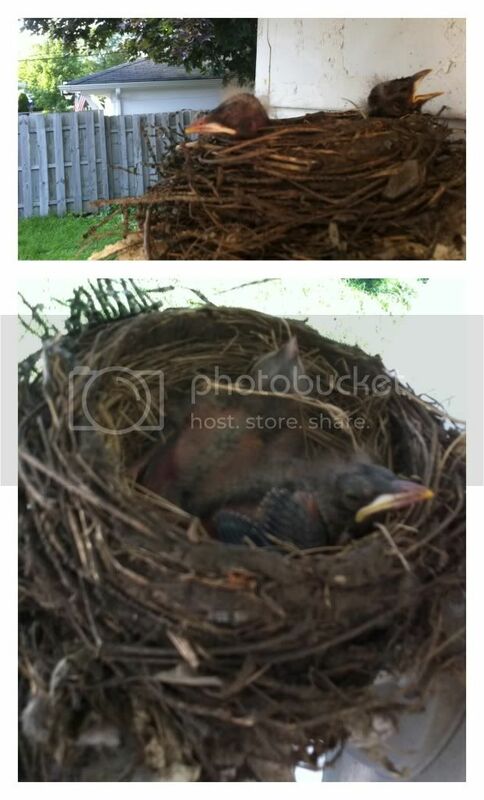 Below are two photos of the remaining two birds as they're growing bigger in the nest. It's really funny to watch the mom land on the edge of the nest to feed the babies, and the two baby bird heads sticking up and wiggling around to get food. Soon, they'll be big enough to fly away, and I'll be sad again. I have the not-so-great habit of spending my Etsy earnings on other internet shopping sprees... but the things I find are really really cool, so I thought I'd share some of these neat-o items with you. The first little guy is Vic the Velociraptor. 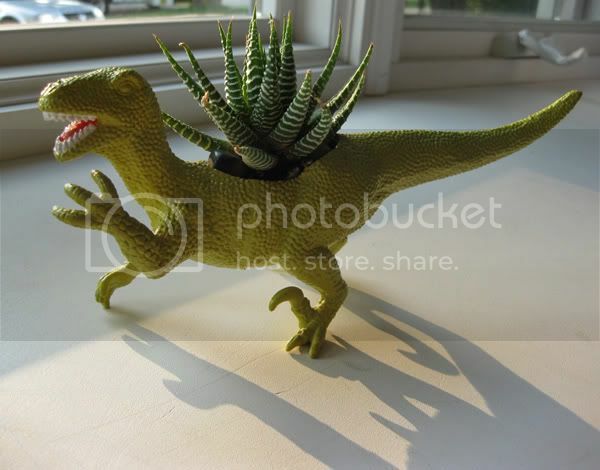 He's a plastic toy dinosaur with a real succulent plant growing out of his back! It's made by Plaid Pigeon and can be purchased via their Etsy shop. He currently hangs out in our living room on a shelf, but I'm thinking he may earn a prominent spot on the mantle soon! 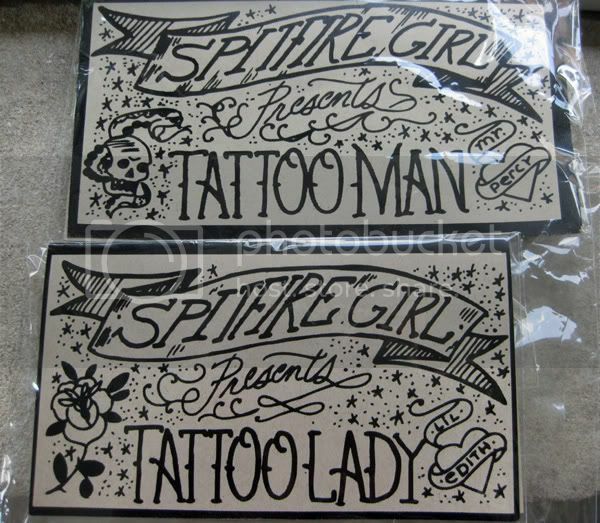 I found this sweet pair of Tattooed Man (Mr. Percy) and Tattooed Lady (Lil Edith) dolls on Spitfire Girl. They do not come as a pair, you have to buy them separately, but I found it really hard to choose just one, so I splurged and bought both. These dolls hang out on the bed in our spare room. 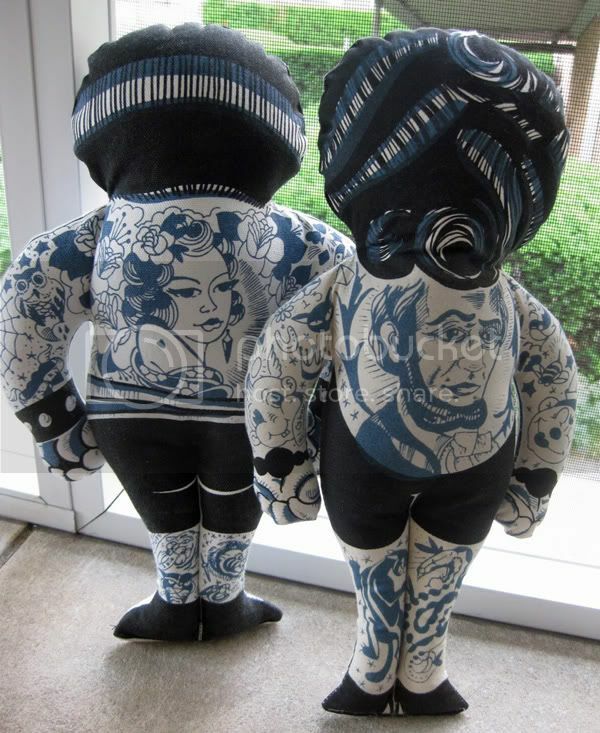 Since these dolls are basically canvas plush pillows without any buttons or removable parts, I was thinking that they'd also make really fun and unusual baby gifts for a friend! Below are the fun tags attached to the packaging they came in. Don't forget to also do your summer shopping at the Hell Razor store! I'm currently working on a whole bunch of butterfly bobby pins and I have a small collection of new rosary necklaces to complete! Because it's summertime (and we're both teachers), money gets a little tight at our house this time of year... so support your favorite independent artists and buy some stuff! Thanks! Oh, yeah, it's Wardrobe Wednesday, but I don't have any photos to show you in the wardrobe department... there are some issues I'll be sharing soon regarding that... 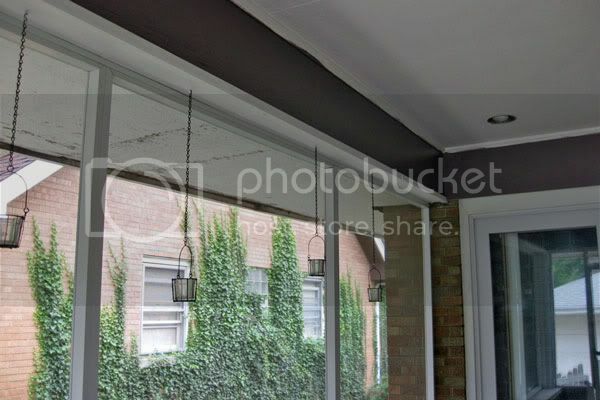 In the meantime, enjoy these photos of my latest work in progress: the back porch! This photo above shows you the ceiling after Todd surprised me one day with scraping and sanding ALL of it! Then, he primed the whole ceiling and border. I'm not sure what to call this foot tall wooden border-like section around the porch, so I'll just call it a border. In any case, it was also peeling and nasty, so he scraped, sanded, and primed this, too. What a guy. The purpleish/gray color you see is what I painted over the primer. I know I did the edges messy - lay off, ok? - it's a work in progress and it's going to be covered up with new crown molding soon! Oh yeah, those little hanging votive candle baskets are something I added last year. They're super pretty when you light them at night. 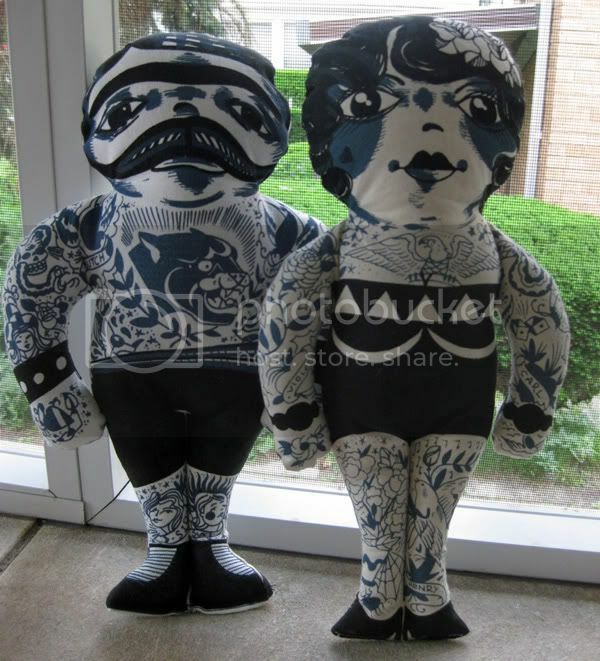 I'm pretty sure they came from Crate and Barrel and were a wedding present. 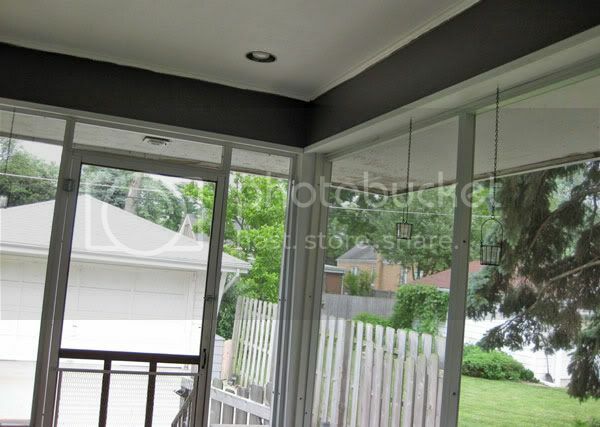 We added some varying lengths of chain and used tiny cup hooks to hang them from the wood trim around the porch. 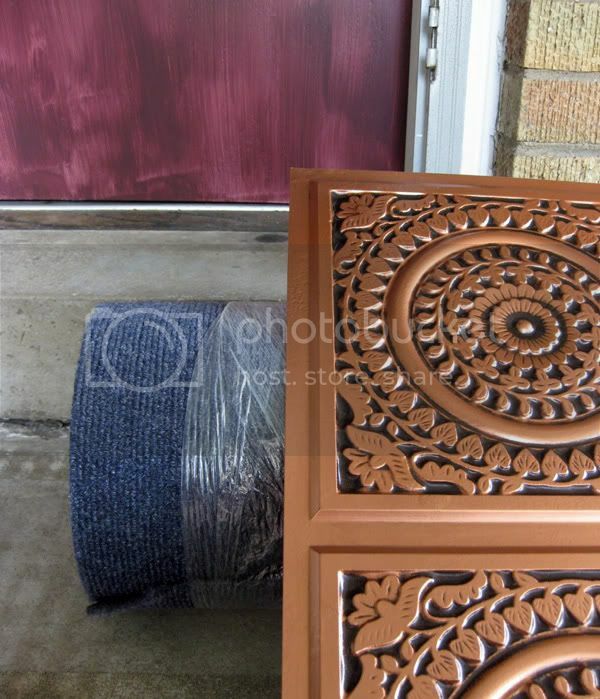 These are some of the things I've purchased and that are in progress for the back porch. In the foreground are faux metal ceiling tiles in antique copper finish that I special ordered. They will be installed on the ceiling with adhesive. They're super lightweight plastic and can be cut with scissors! Also, they look beautiful with the orange brick of the house and the purple paint colors that I like! In the background, you can see the bottom of our back door. It's not done yet, but it's a preview of the color. It's a good solid wood door, but the stain and varnish were uneven and weathered over many years of existence. I gave it a light sanding, primed it, and am now in the process of giving it 2-3 coats of awesome warm purplish brown paint. 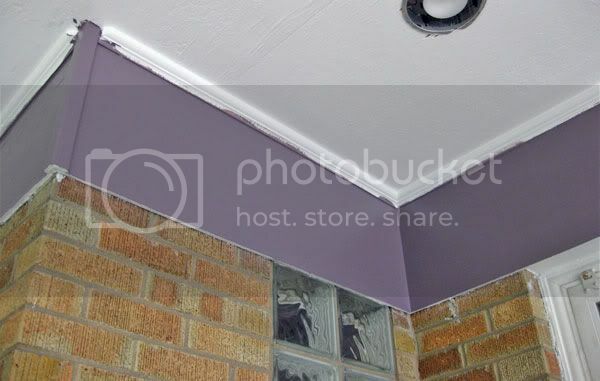 It complements both the purple border and the warm color of the bricks on our house. In the last two days Todd and I have actually completed most of these plans, but we're not quite finished yet, so I'm saving the grand finale for another post. I'll be sure to give you a cute little photo tour then, but I can reveal that that I have a theme not only of color, but of circles! (Don't worry, I'm not even close to being a matchy-matchy girl. I hate those bedroom sets where the comforter matches the rug that matches the curtains that match the throw pillows, and so on, and so on.) This is gonna be cool. Today we went on a really fun field trip to two of my favorite places: Kuma's Corner and Rotofugi. Since I've already written about those places before, I'm dedicating this post to the third place we went to, where I hadn't ever been to before but really loved! 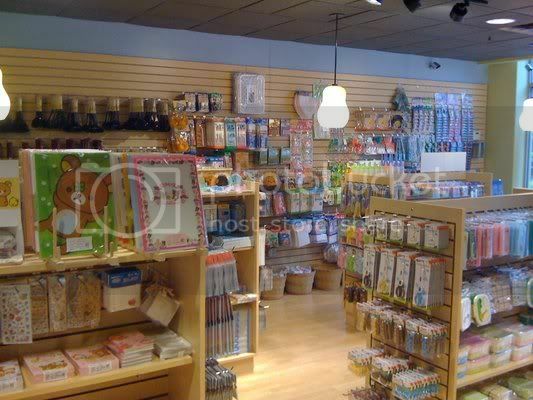 It's called Kawaii Japenese Outlet, and is located in the area of Chicago around UIC. I couldn't find an official website, but I did find information about the store on Yelp, and they also have a Facebook page. They're located at 1338 S. Halsted Street in Chicago, and you can call them at (312) 970-0094. They do have shorter summer hours, so call ahead to make sure they're open - it's not as late as they show on the Yelp page, just FYI. 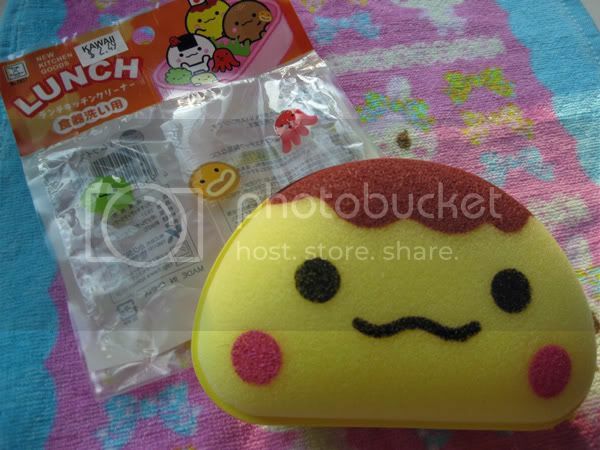 Kawaii sells lots of household goods and cute things. They have a small stationery/office products section, an origami paper display, lots of bowls and tiny plates, tea sets, kitchen gadgets, kids items, a small grocery section with dry goods... but my favorite section of the store was all of the bento boxes and accessories for making bento, although I didn't even know what all of it was for! I wish I was more patient for that kind of thing... maybe I have a new future hobby! They had shapers for eggs and rice (I think?) and tiny salt and pepper shakers to-go, and lots of tiny boxes. I was very entertained by the shaped punches for seaweed sheets, for making your lunch more pretty! 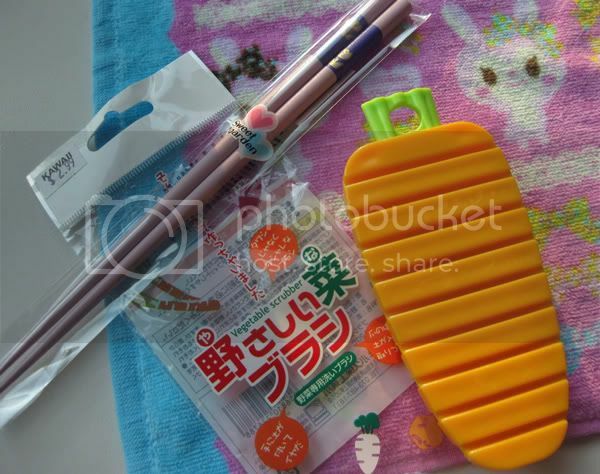 Here's some of the cool things I snagged while there: a vegetable scrubber shaped like a carrot. I was excited about this because I like to eat cucumbers without peeling them, and this seemed like a fun way to clean them off. The carrot brush actually bends to the curve of the veggie! I also picked out some pretty pinkish-lavender chopsticks (we actually have quite a collection at home, but these ones looked super special, just for me!) and a super cute printed washcloth to make removing my makeup more fun. I actually had to spend some time pondering WHICH super cute kitchen sponge to buy. There were many. I decided on this guy with the pink cheeks, but there were seriously about a dozen I would've taken home with me. Maybe I should've grabbed a few so that I had extra? Hmm... now I have a reason to go back! 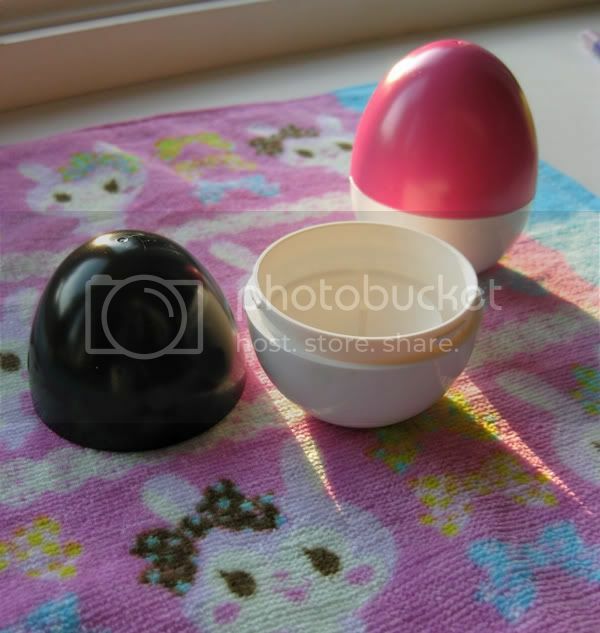 Okay, even Todd got excited about this purchase - hard boiled-egg holders for lunches! We love to make a bunch during the school year and to take them for lunch, but they are hard to package... I usually go with a paper towel/foil wrapper for safety and peeling's sake. But not anymore... problem solved! If you couldn't figure out, the black/white one is Todd's, the pink/white is me. 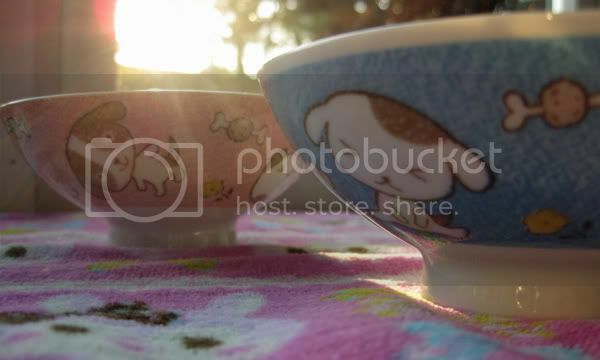 My final selection at the store were these two cute pup bowls. I picked out one pink, one blue (you know, a girl bowl and a boy bowl...) and figure we can use these for rice or soup or even snacks at night! There were several tiny cute decorated bowls to choose from, and I had to debate a little before deciding on these. But these are the fun kind of decisions to make! Do any of you have experience with bento? I'd love to learn more so that I can return and pick out a box for myself, along with some cute bento-making accessories!